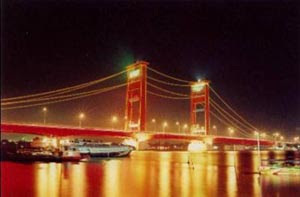 Palembang city is one of the city tourism destination. forged with the city's Visit Musi 2009 Palembang beautify themselves under the Government of former Governor of South Sumatra, Mr. Ir.H.Syahrial Oesman MM, and the Mayor of palembang Mr. Ir.H.Eddy Santana Putra . during the last few years, this palembang decorate themselves, and start slowly gradually beautify itself with managing the city and region and improve the economy. Than a few years ago palembang changed very rapidly, it seems like a dream, a sense does not believe is always the question, whether the city properly this palembang the first known city with the most dirty, most vile and criminal as the center, a city that is very neglected in Indonesia. Palembang experience as evidence of progress is to build an adequate settlement’s, shops and shopping centers where there is, bridge play over development, development of international Seaport Tanjung Api-Api, the Airport as the embarkation jema'ah Hajj and barns as the food and energy added again to obtain the award 2 years respectively adipura participate stars Mahaputra leaders get an appreciation and highest glory. All this on the success of the regional leaders such as Governor, and the Guardians of the Regent, but the peak period is the period running to the Governor of South Sumatra, Mr. Ir.H. Syahrial Oesman with its formation and the Mayor of the city of Palembang is a special Mr. Ir.H.Eddy Santana Putra and the supporting. Throughout history palembang new city he is what he can raise the degree and dignity sumatera south of the city, especially palembang. 1. 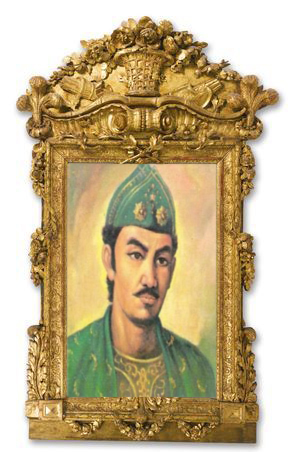 Getting up Mahaputra Star Award success led the South Sumatra. 2. Improve the welfare people, teachers and staff Profinsi South Sumatera. 3. program plan barn food and energy. 5. Completing Sports Stadium Jaka recline the international stages. 6. Complete the development of Airport Sultan Machmud Badaruddin II as the airport departure embarkation jema'ah Hajj. 7. Complete the Project Development Tanjung Api-Api seaport The International stages that have been obstructed for many years. and many more are in other districts. The dignity and the dignity of the community palembang city, he is also in line with the governor of southern sumatera Mr.Ir.Syahrial Oesman.MM. 1. muted so that the level of crime palembang now guaranteed to be secure. 2. managing and maintaining the cleanliness of the palembang city who were not regular, so he get a trophy Adipura award for 2 consecutive years respectively and Asean Environment Sustainable City 2008 as the most clean city in all of Asean. 3. Getting back water fountain which is a typical characteristics of the city palembang and community pride, which is decorated with light colors such as the Kingdom of the garden, very beautiful when seen at night. 4. Ampera bridge that the first dormant now decorated with beautiful lights and colors in the wake Warni parks recreation, which is the beautiful scenery for the palembang public who can enjoy the night while sitting relaxed in the Musi river edge. 5. restructure Kuto Besak Fort the bunker over the survival time of first created as a place higgler pavement that looks very grubby settlement as the gutter, now look very beautiful palace not far from the palembang Sultanate. 6. and much more development that is presented to the palembang public that I can not mention one by one. Palembang not have a beach tour, palembang also do not have the natural scenery such as mountains and hills but have palembang nautical tourism is tourism that the survival time of the kingdom of Sriwijaya and survival time of over palembang darusallam, such as the tomb of the king, the ancient site, the graves of Aulia and carers who have a large kharismatik, while tourism and natural hilly and mountainous border area is in the clever part South Sumatera. Residual Sriwijaya Kingdom itself not one hundred percent can be extracted, there are many more buried and the residual potential, such as pure gold, gold statues, gold plates, glassware, boats Ju-kung the era China Dynasty and India and is still a lot of wealth trove of hidden earth Sriwijaya.